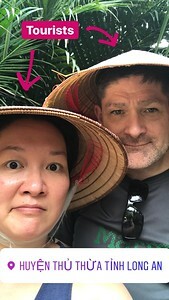 During our nine days in Southern Vietnam, we booked several tours that would get us out of our home base in Ho Chi Minh City. One of the tours we booked was the day-long Authentic Mekong Delta tour with Les Rives, a reputable tour company in the area. We were picked up around in the lobby of our hotel in District 1. They were running a bit late from our original pickup time and had called the hotel to let us know – an attention to detail that I appreciate. We were picked up in a small transport van with a few others who were also on our tour that day and then brought to the pier. After a brief stop for restrooms at the departure point, we were escorted onto the boat that easily accommodated the 12 people on the tour. Immediately after departure, our tour director Kha made introductions with the captain, mechanic, and the food and beverage assistant. Then Kha handed out our light breakfast – a choice of a bahn mi sandwich or a plain croissant + fruit + either black coffee or coffee with milk. The food and beverage was served as we were cruising along the Saigon River. ^An example of the stilt houses along the river. As we made our way along the river, Kha warned us that we would see some abject poverty as we left the city. 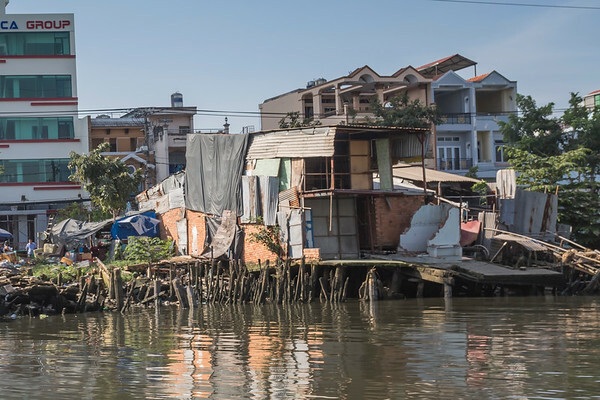 The wealth/poverty gap is very wide and it is seen in the illegal stilt houses that are built over the riverbanks (with multi-million dollar condos going up in the skyline behind). They are lean-tos that look barely livable, have no running water, and no plumbing – so human waste just goes directly in the river. The situation is made worse by the small manufacturers that dot the river, who also freely pollute without fear of penalty. The sum total is that the first part of the river – about the first 20 minutes of the ride – is downright dirty. 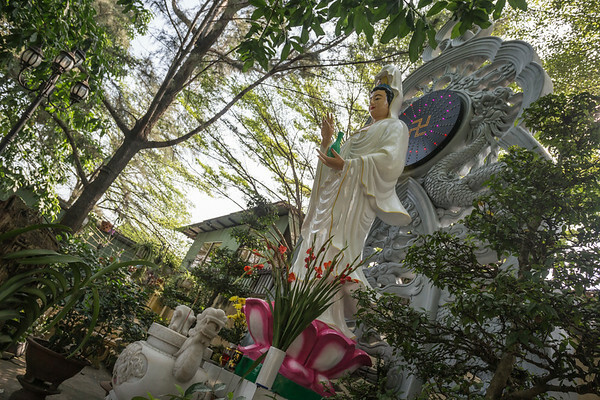 ^A statue at the An Quang temple. 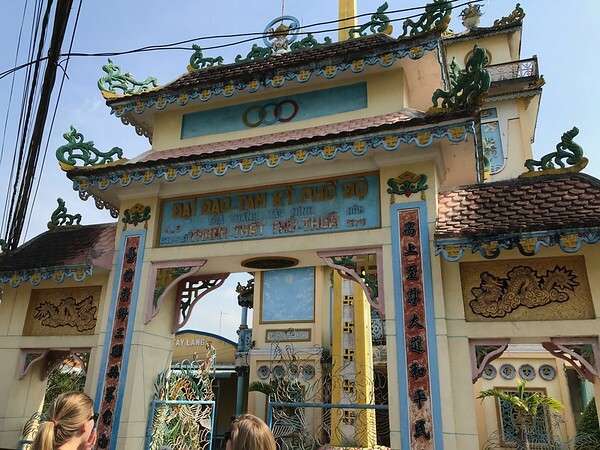 The first stop after boarding the boat is to the An Quang Buddhist temple. You are essentially entering from the back of the property and walk toward the temple/the street side. We were lucky enough to catch a glimpse of a Buddhist wedding that was happening that day. After a brief restroom break, we were back on the boat. The next stop was a visit to a Mekong Delta village. Along the way, we stopped to see a rice paddy field while our guide explained how water issues are affecting farmers in the area. Further along, we decamped from the boat after taking a few turns along narrow-ish river ways. Walking along a dirt path, we saw tapioca trees ready for planting outside of a farmer’s home and visited another home whose owner trains bonsai for a living. Interestingly, the tapioca trees are planted at an angle to the ground rather than in a traditional vertical/upright position. This slanted angle helps them to weather the strong winds that occur during the rainy monsoon season. 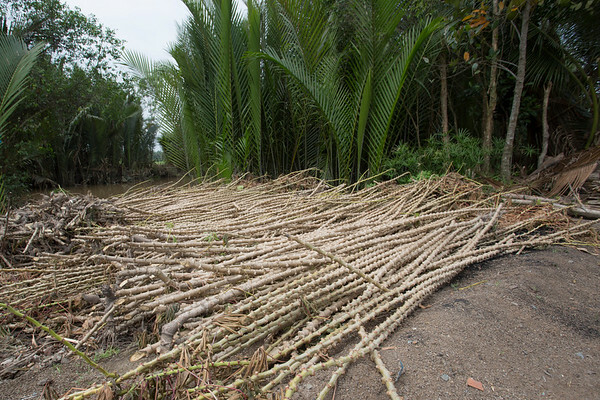 ^Tapioca trees are stripped of leaves and ready for planting. After this short walk, we were back on the boat to visit a local farm and to learn about (and sample) rice wine while we sipped on fresh coconut water. 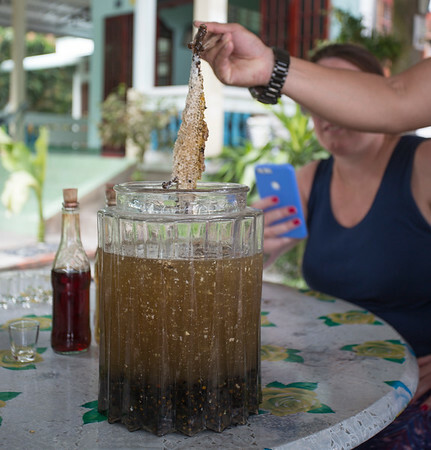 ^Rice wine made with royal jelly. The dark layer in the jar is a layer of dead baby bees. Next stop was a short ride in a row boat where we were made to don the classic Asian pointy hats. We split into two groups and boarded the small boats, both helmed by women paddlers. I didn’t realize it until we were in the row boats that not only had we passed these women on the way in, but that we were paddling back toward the nearest intersection, which was close enough to walk to. This part of the tour was the most obvious in terms of needless activities catering to tourists. ^Totally blending in, am I right? We were dropped off on the side of a narrow road, where we took a short walk to the local wet market. Wet market meaning that there were live seafood available for sale in addition to the dry goods like rice, grains, etc. The wet market is similar to ones we toured in Ho Chi Minh City. Vendors usually specialize in one trade: seafood, meat, cured meat, dry goods, etc. Wet markets have that distinct smell of a place that has no running water but is trading in fish, butchered meat and other live or formerly live goods. It was finally mid-day and it was time for lunch. We walked through town to the local orphanage where we would have a hot lunch that was made by the orphans. As a Westerner, it was a bit jarring to walk through the wet market and see all of the unsanitary (by Western standards) conditions such as heaps of flies landing on the seafood and meat, and then sit down to a lunch featuring… seafood and meat. One of my tourmates did comment that he refused to believe that any of the food was clean after seeing the market, the likely place where our lunch ingredients originated. I noticed that he avoided the spring rolls that contained shrimp and pork, and mainly stuck to eating rice and sauce. I ate the spring rolls and everything else that was served and had no issues whatsoever. The lunch featured the aforementioned spring rolls, chicken, tofu, soup, and the star of the lunch: the elephant ear fish (real name: gourami). 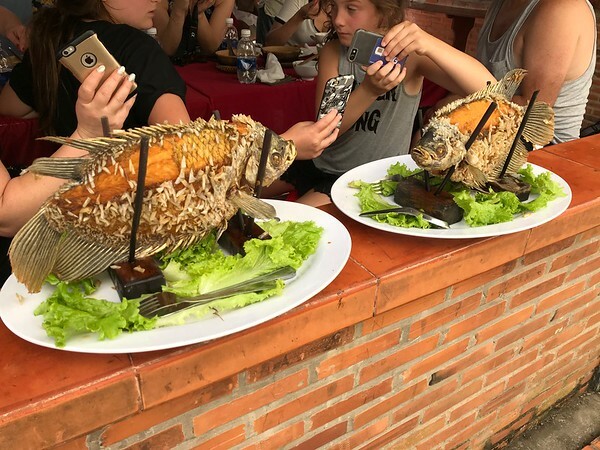 This fish is indigenous to the Mekong Delta and is typically served deep fried and presented on a rack. After the presentation, the whole fish is laid on its side and the flesh is scraped from the bones. It is eaten over rice or can be wrapped in a spring roll wrapper with other ingredients. It is a mild white fish that i did not find had a distinct flavor of any kind. The final course of our delightful lunch was a dessert of cut fruit. The one takeaway I had from our week in Vietnam is that the Vietnamese view sweets and sugar so differently than Americans do. Sweet is a taste that is used in balance with other tastes, so a big, sugary dessert is outside of the norm. That’s not a bad thing. There was one more stop after lunch and before we boarded the boat to get back to the city. 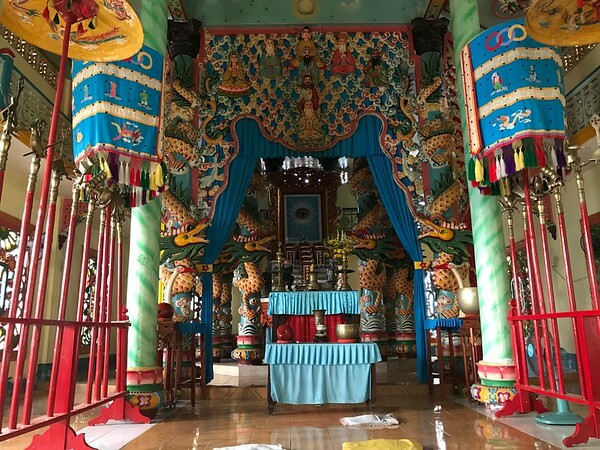 We stopped at the local pagoda to learn about its history and the Caodaiism religion. The gates prominently announce “Đại Đạo Tam Kỳ Phổ Độ” which is the official (long) name of Caodaism, a religion founded in Southern Vietnam in 1926. You can read more about Caodaism on Wikipedia. From here, it was a short walk back to the boat and a full speed return to Ho Chi Minh City. Fruit from the market was served as a snack on the way back. Without stops, the return trip took about an hour and a half, which landed us back at the pier around 5pm. We were returned to our hotel lobby by 5:30pm. It was a busy and interesting day trip. Going on a speed boat by river was much better than going by bus, especially since traffic can be so terrible getting out of the city. The Les Rives Authentic Mekong Delta tour is expensive in comparison to other day trip options offered by other tour companies but it was totally worth it.